Weekends are here, enjoy your movie with a bowl of popcorn prawns and ice tea. Thought of having a twist to the popcorn prawns by covering it with coconut instead of the usual bread crumbs. The result turned out to be too good to resist. 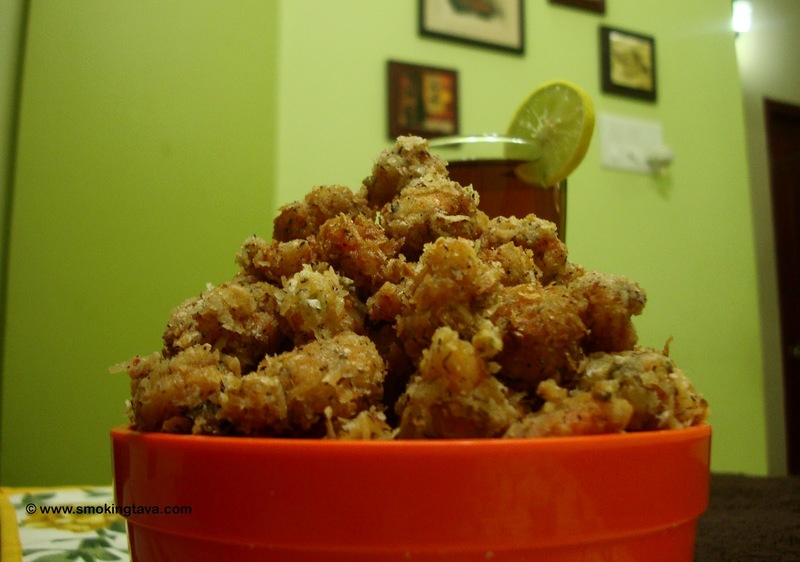 The light sweetness and crunchiness of coconut is pure bliss and I would suggest everyone to try out this very simple recipe. Mix in a bowl, lemon juice, coriander leaves, chilly powder, salt. To this add prawns, mix and leave it for 15-20 minutes. Coat the prawn chunks in the corn flour, pat it to remove any extra corn flour. Dip into the egg and coat it with grated coconut. Deep fry on medium flame for around a minute till they are golden brown. Do not over cook the prawns else they become rubbery. Enjoy popcorn prawns. Try out and let me know how it turned out for you.